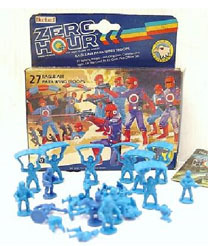 In 1989 a range of 1/72 scale soldiers, some with vehicles, was sold in Europe under the name of "Bluebird Zero Hour". 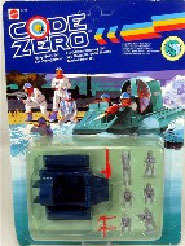 At the same time the same range, but in slightly different packaging, was sold in North America under the name of "Mattel Code Zero". 25 different boxes were made, which between them contained 71 different soldier poses and about 40 or so different vehicles, boats, planes and a train. The soldiers were made in 15 different colors to identify the different types of armies, navy, marines etc. Infantry Only - These contained four sprues of 6 figures each plus an extra sprue with three figures, making a total of 27. There were no vehicles in these boxes. One Vehicle - Along with the vehicle these sets contained six loose figures, and were mostly presented in blister packs. Combined Set - These contained two vehicles and nine figures - one sprue of six and one of three. Big Box - These contained more than two vehicles and differing amounts of figures. The ultimate of these products was the 'Supreme HQ' set. Along with the different branding the sets were sold in the two markets with different packaging and usually different names too. The list below details the full range, with both Zero Hour and Code Zero names and codes (where known). The 'Figure Colour and Type' column refers to the 'Soldiers' section below. 910781 Para-Wing Hornet Microlight 13 & ? The figures in these sets are described below, and we have grouped them by size and colour as they appeared in the sets. The numbers assigned to the groups below relate to the 'Figure Colour and Type' column in the above table. The figures are all around 25mm in height and therefore are 1/72 scale. 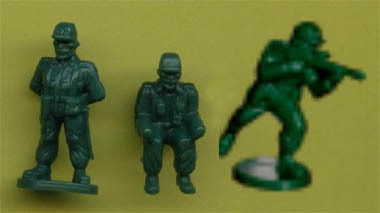 These were used as 'officers' in many boxes, and depict airforce troops. These were the airforce squadron troops. Also used as airforce infantry troops. These were used as army officers. This set was the regular army infantry. This was the first of the 'BAD' troops. This was the second set of the 'BAD' troops. These are the officers of the second regular infantry type. These soldiers can only be found in the Supreme HQ set and are thus sometimes difficult to find. This is the second regular infantry type. These are the officers of the Navy. This is the navy 'Infantry'. These black troops are very rare and difficult to find. They can only be found in the 'BAD scorpion force' set. 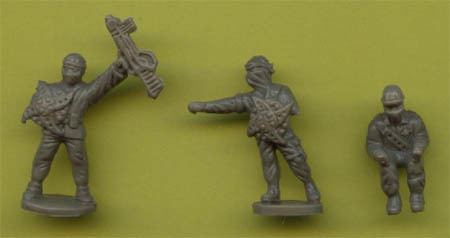 These ninja style troops can only be found in the 'Rhino armoured missile carrier' set. Thus they are also rare. These are the regular para troops. Also sold in infantry style boxes. This 3rd set of BAD troops can only be found in the 'BAD powers winged demon' set. Rare. This last set of Ninja’s is extremely rare. It only came with the 'Rhino Armoured Missile Carrier' set and the 'Army Close Combat Troops' sets, which is almost impossible to find. Below is a table that summarizes all soldiers and their colors + the amount of poses.